INDUSTRY.co.id - Manado - Talk show "Preventing the Risk of Coronary Heart with Healthy Lifestyle" apparently attracted people in Manado city. Attention is seen when Siloam Manado Hospital held a talk show that diloby hospital. Hundreds of participants attended the lobbies to follow and hear the material presented by Dr. Ir. Marsel Luntungan, Sp. Jp. as the Heart Specialist Doctor from Siloam Manado Hospital. Even discussion and question and answer will not be completed if not limited by the moderator. In the talk show, it was revealed that the risk of heart disease is more likely to occur to people who have a history of families with heart disease, smoking, hypertension and diabetes. Dr. Marsel Luntungan, Sp. Jp. justify the risk of coronary heart disease, according to the results of research said 50% of heart patients inherited from the family. 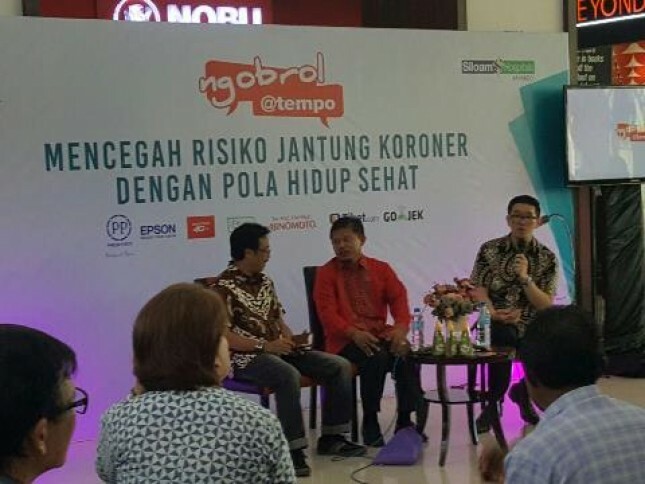 "If there is one family who suffered from heart disease, should early on to maintain a healthy lifestyle and reduce consumption of food or bad habits that are at risk of cardiovascular performance," said Marsel Luntungan reminded, in Manado recently. To add information about healthy lifestyle, Siloam Manado party also presents nutritionist from Jakarta, that is, Prof. Dr. Ir. Ahmad Sulaeman. On the occasion, Prof. Ahmad Sulaeman explained the importance of fibrous diet and limiting the amount of foods that have high cholesterol levels. Not to forget, regular sports activities and enough drinking of mineral water was presented by the nutritionist. On the occasion, will the attention and interest of participants, Diana Kawatu, Director of RS. Siloam Manado admitted happy and a little surprised. Diana explained the health socialization activities conducted by Siloam Manado to the people of Manado City, routinely done by the hospital every month. "This is our effort as a health service that routinely conveys healthy information to the public for the information submitted on target and up to those who need information about health," said Diana Kawatu.